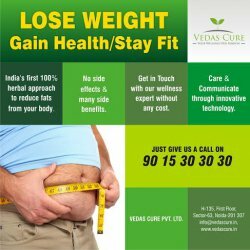 Break the weight gain cycle with Vedas Fats Cure. The natural and herbal product is absolutely safe and the result is permanent and guaranteed. There is no side effect but many side benefits of our product. Our Healthcare Information System keeps you reminding for taking medicine on time and other health related updates are regularly sent to you.